Reigning Dunlop MSA British Touring Car Champion Ash Sutton ignited his title defence with a double victory at Croft, before BTC Norlin Racing’s Daniel Lloyd became the latest BTCC race winner by taking the honours in the final contest at the North Yorkshire venue. 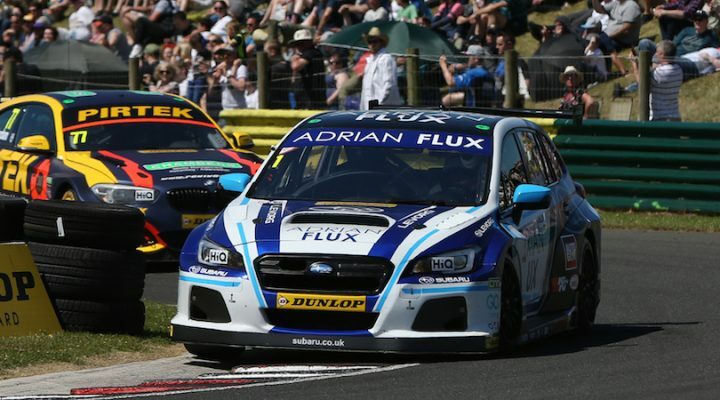 Adrian Flux Subaru Racing’s Sutton claimed pole position on Saturday and followed that up with a dominant lights-to-flag win in Sunday’s opener. The 24-year-old then fought his way past Tom Ingram’s Speedworks Motorsport Toyota Avensis to win the second bout. Subaru scored a one-two finish in the first race as Sutton and team-mate Jason Plato fended off their rivals. Sutton took his win in relative comfort as Plato battled with BMW Pirtek Racing’s Andrew Jordan for much of the contest. Jordan nipped into second on the run down to turn one on the opening lap, and the BMW 125i M Sport driver spent most of the race trying to defend from Plato. The 2013 champion couldn’t hang on, however, and eventually had to relinquish second to the #99 Subaru Levorg. Things got worse for Jordan as, struggling with his rear tyres, he lost grasp of a podium place after running off-track through Clervaux late on, which allowed the impressive Ingram by to complete the rostrum order. Team GardX Racing with Motorbase’s Sam Tordoff produced a masterful defensive drive to take fourth as he held off the Team BMWs of Colin Turkington and Rob Collard for the entire 17-lap race, whilst Power Maxed TAG Racing’s Josh Cook looked on from behind. Sutton, Ingram and Plato then went three-wide on the run down to Clervaux at the start of the second race and when the dust settled it was Ingram’s Avensis that had been muscled to the head of the pack. Plato was adjudged to have jumped the start and handed a drive through penalty, shortly before Sutton had slipped back by Ingram at the hairpin on lap two. After the early action fallout we were left with Sutton leading home Ingram, with Turkington’s BMW closely following in third. As in the first race, Tordoff settled in fourth place. Incredibly it was the sixth time that the Yorkshireman had finished fourth on his return to the series, although he’s yet to make the podium this season. BTC Norlin Racing’s Lloyd then became the latest new BTCC race winner in the thrilling finale around the 2.13-mile circuit. Not only was it the first ever BTCC win for local man Lloyd, made even sweeter by coming at his home track, but it was also the first top-step success for BTC Norlin Racing in Britain’s premier motorsport series. Tom Chilton took second for Team Shredded Wheat Racing with Gallagher after he impressively fired his Ford Focus off the line from fourth on the grid. Senna Proctor completed the podium positions for Power Maxed TAG Racing, yielding yet another great return for the fledgling Vauxhall-backed squad. The team endured a difficult meeting last time out at Oulton Park and looked set to miss out on more trophies here in North Yorkshire, but Proctor’s podium proved a perfect tonic for the outfit going into the mid-season summer break. A trio of top five finishes for Team BMW’s Turkington kept him on top of the overall standings, which he now leads from Ingram by 19 points, with Halfords Yuasa Racing’s Matt Neal a further 17 in arrears. BMW holds the advantage in the Manufacturers’ and Teams’ tables, whilst Tom Ingram and Speedworks head both the Independents’ orders. Lloyd also took a clean sweep of wins in the Jack Sears Trophy at Croft, although Honda’s rookie Dan Cammish still leads the way in that particular category. The Dunlop MSA British Touring Car Championship now enters its five-week mid-season hiatus and will return to action on 28/29 at Snetterton in Norfolk.